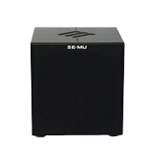 E-MU's new PS12 Precision Subwoofer features a premium 12" driver and custom discrete 200 watt MOSFET amplifier in a compact, sealed cabinet design to deliver superior transient response and low distortion. From nuanced acoustic performances to extreme club mixes, the PS12 delivers linear frequency response down to 22Hz. Whether used in conjunction with E-MU's PM5 Precision Monitors or other speakers, the PS12 is perfect for both stereo and surround applications with professional features.